I’ve stayed in edgy Shoreditch and aristocratic Kensington (I even lived in buzzy Oxford Circus for a semester in college), but the neighborhood I prefer to make home base when I visit these days is Holborn. Smack-dab in the middle of the sprawling metropolis, Holborn is like Midtown Manhattan making it one of the best places to stay in London if you want to maximize sight seeing time and minimize time spent below ground on the tube. Thanks to great hotels and plenty of lively dining and drinking venues, it’s hip and cool too. And if you happen to be traveling in London with a pet check out this story from my friends at AllTheRooms Airbnb London: Best Areas for Pet-Friendly Accommodation. *I’ve included some places in Covent Garden because it’s so close. This small restaurant in Neal’s Yard, a pedestrian only street and courtyard, serves sweet and savory porridges that are much more interesting than oatmeal with nuts and brown sugar. 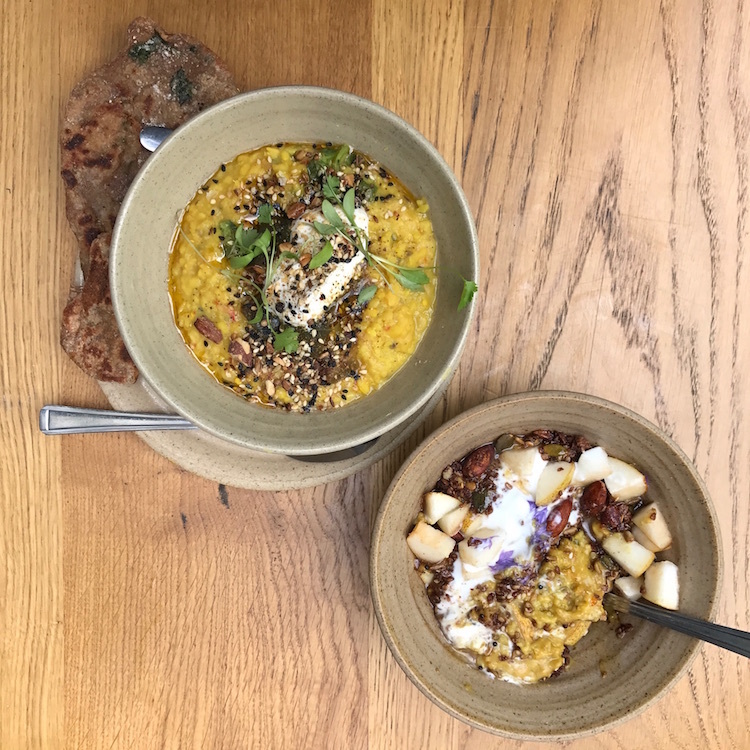 Ever changing seasonal combinations might include salmon porridge with beetroot and egg or raspberry with salted cashew praline and Greek yoghurt, a collaboration with a Michelin starred chef. 26 Grains includes just a handful of tables and a small counter, but there are more places to sit in the courtyard. Sweet and savory porridges at 26 Grains will forever change the way you think about oatmeal. I have a soft spot for Ben’s Cookies. In my mid-20s, I ate at one of the original locations in Bath, England. I was ecstatic when I found out the only location in the US was in Salt Lake City Utah, a city I was living close to at the time. Going there was like experiencing a piece of the United Kingdom. The company has expanded to include location through London including a shop in Covent Garden. The smell of fresh baked cookies wafts through the covered arcades. My favorite pillowy cookie is the simple milk chocolate. Rosewood London’s British brasserie, Holborn Dining Room, has many faces. In the morning, it’s a bustling city diner. 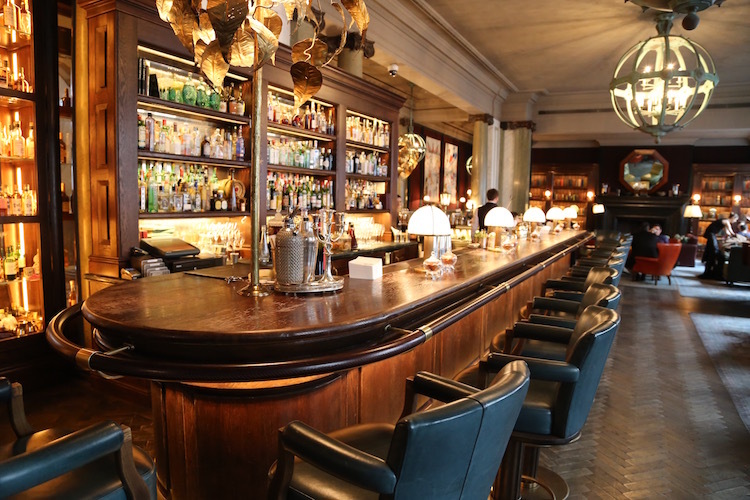 At lunchtime, it’s a sophisticated spot for a business lunch and by night it’s one of the world’s great gin bars with a selection of 500 gins and 30 tonics. Pull up a seat at the bar and the knowledgeable bartenders will tell you everything you’ve ever wanted to know about gin and pour you a concoction that perfectly suits your mood and palate. One of London’s longtime coffee roasters is still its best. Monmouth began roasting coffee using old-fashioned machines in a basement in Covent Garden in 1978. Today, its roasting facility is in Bermondsey, but it still has a Covent Garden storefront. The space features minimalist design, excellent French pastries and strong nuanced coffee. The beans always come from sustainable, fair trade farms and cooperatives. The Scarfes Bar is both whimsical and warm. Named for cartoonist Gerald Scarfe, the cocktail bar at the Rosewood London is decorated with his caricatures of British icons from Queen Elizabeth to the Beattles. It feel warm and cozy with a roaring fire at one end and upholstered chairs and sofas in jewel-toned colors. Scarfes Bar is big and buzzy too. It hosts live jazz bands regularly. Sophisticated yet whimsical cocktails are inspired by British pop-culture figures such as the Zingy Stardust, David Bowie that includes shiso, kaffir lime leaves, Absolute Elyx and Electric Bitters. 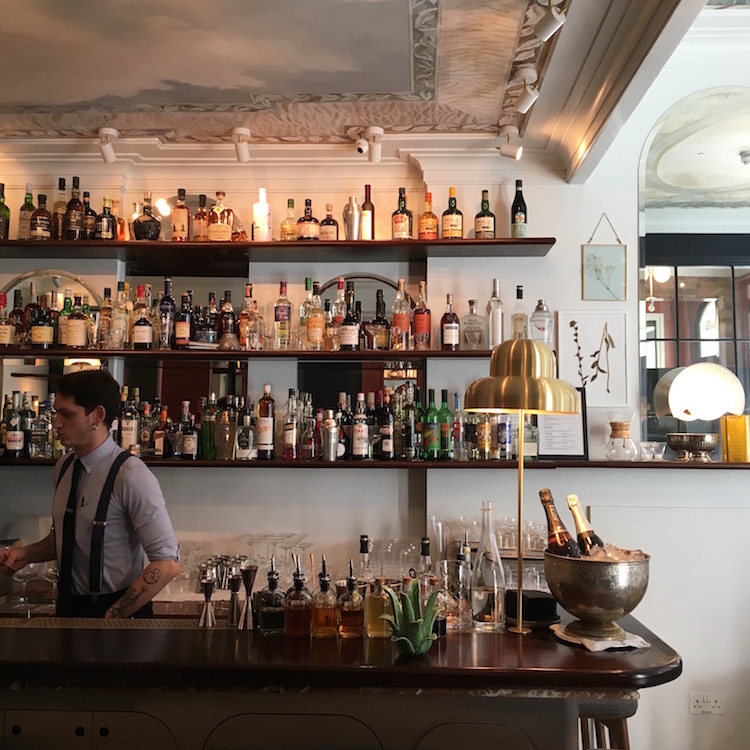 This restaurant in a 19th century drawing room decorated with white columns and a marble bar is a gorgeous place to dine, but it’s much more then a pretty face. Australian chef Skye Gyngell won a Michelin star working at Petersham Nurseries and she has become one of the city’s most celebrated chefs. Her style is seasonal, refrained and completely delicious. Italian-influenced dishes rarely have more then about five ingredients such as the peach and San Daniele with honey and rose water and the Guinea fowl with sweetcorn purée, girolles and dill butter. The vast British Museum houses one of the world’s most impressive collections of art and artifacts. Some of the most famous objects include the Rosetta Stone, the key to discovering Egyptian hieroglyphics and the Parthenon Frieze. The latter, a high relief marble sculpture created to adorn the Parthenon in Athens, is the source of some controversy. The panels were removed from the Acropolis by Thomas Bruce, 7th Earl of Elgin between 1801 and 1812 and sold to the British government in 1816. Greece has expressed its desire to have them returned, but Britain refuses on the grounds its become a part of its culture. Other artifacts worth seeking out include the Lewis Chessman, and the Assyrian Lion Hunt reliefs. The British Museum is free to all visitors although donations are accepted. Once home to a world renowned fruit and vegetable market, Covent Garden continues to draw visitors and provide a public gathering space in the heart of the city. In the 19th century Apple Market with its arched ceilings and covered arcades, luxury boutiques like Chanel and L’Occitane en Provence occupy permanent stall space while market traders sell handmade goods like jewelry and candles throughout the week. The pedestrian only plaza around the market is a popular place for street musicians to set up shop. Covent Garden has become the place to get a taste of New York City in London. There’s a Shake Shack and a Balthazar restaurant nearby. It’s a short walk from the Covent Garden tube station at the end of James Street to the Apple Market building. Just continue down the street until you find it. The second longest running non-musical play in the West End, the Woman in Black has been playing since 1989. It’s performed by only three actors and there are very few sets, but the spine tingling story is captivating and transports you to a small English town during the 18th century. Don’t be surprised if you find yourself clinging to your companion during Act II. Due to its long run, tickets can almost always be purchased last minute and prices are very reasonable for a West End play. They start at around €27.50 a piece. The cocktail bar at the Henrietta Hotel. With rooms starting at around $126 a night, the Hoxton Holborn is an absolute steal in this expensive city. Not only is it centrally located, it’s just steps from the Holborn tube station, it features hip industrial design and a buzzy lobby where you’ll feel equally at home working on your computer or sipping a jalapeño margarita. Entry level “shoebox” rooms are indeed snug, but you won’t want to spend much time there anyways. The hotel has a coffee shop and two restaurants, the diner-esque Hubbard & Bell, and the below ground rotisserie Chicken Shop. All guest rooms featured bespoke wallpaper with scenes from Charles Dickens novels. The breakfast bag including a banana and milk included in your stay is a nice perk. 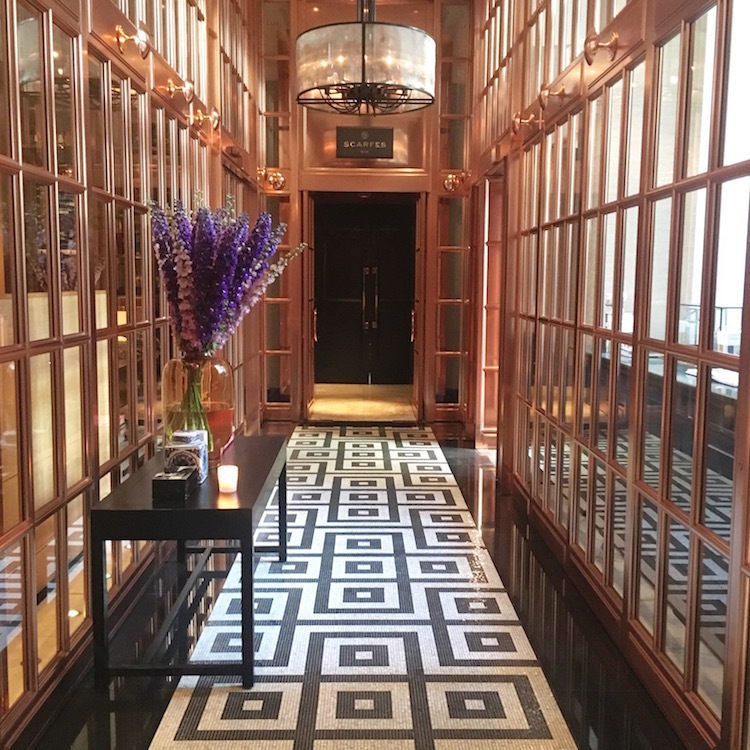 A rose-colored foyer at the Rosewood London.